The i know mission is to arm you with what you need to know to plan for the future. Care for someone you love. Age with joy and grace. Once a year at the i know expo. And every day of the year right here on this website. 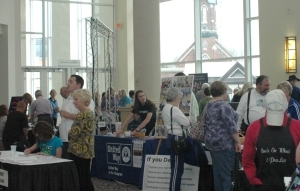 The i know expo® is a FREE event for people of all ages and life stages: living out their golden years; taking care of someone they love; coping with difficult health situations or simply smart enough to know it’s never too early to start planning for the future. The i know expo will empower us with information about the services, resources and support available to make the rest of life the best of life. You can walk around, pick up material and chat with experts at individual booths, sit in on informative talks about subjects of interest, enjoy art, music and entertainment. It’s going to be a lively, upbeat, engaging event that can make a real difference in your life or the life of someone you love. Please spread the word to your friends, family, church and social groups. • Know how to find services in your community to help care for a loved one. • Know how to plan for future physical, emotional and financial well-being. • Know how to choose the best option for housing. • Know how to stay mobile, sharp and engaged. • Know how to take care of yourself if you are a caregiver. • Know how to live as independently as possible for as long as possible. Want a glimpse of what our 2017 Expo was like? Click Here to see our wrap up document. Interested in getting involved as a sponsor or exhibitor? Sponsor Application: Click here to find out more about our Sponsorship opportunities and to fill out an application form today! Exhibitor Application: Click here to reserve your Exhibitor Booth space today!